As an organisation, Countdown recognises that people across the whole organisation can benefit from upskilling in language, literacy, communication and numeracy. It has been great working with people in the Countdown Support Office over the last couple of years. Our learners have been merchandisers, logistics people, people in property maintenance, payroll, IT, business support people and a couple of store managers. For these people their whole job is about timely accurate communication keeping stores across the country full and profitable, sorting out problems and thinking of better ways of doing things. Course content has focused on building confidence with clear, accurate written and spoken communication. 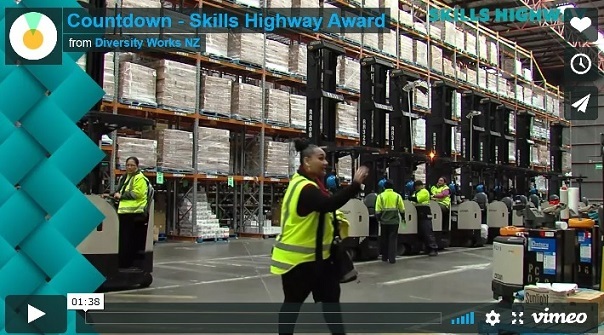 This was part of a much larger initiative for which Countdown were shortlisted for the Skills Highway Award at the recent 2017 Diversity Matters award night at the Langham Hotel. The little video of their programme is really inspiring. Enjoy and be moved.